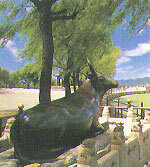 A bronze ox squats at the lakeside near the eastern end of the 17-span bridge and gazes at the Longevity Hill across the Kunming Lake. The casting of this ox after the Kunming Lake was expanded in 1755. or the 20th year of the Qianlong Reign of the Qing Dynasty, was based on inspiration from a tale about King Yu harnessing the rivers in remote antiquity. Off the northern shore of the lake is a giant boat 36 meters in length, built entirely of huge stone slabs. The two-floor pavilion on the boat is decorated with carved beams and lacquered pillars. The presence of this marble boat facilitated seeing the sights on the lake and symbolized the rock-firm role of the Qing Dynasty.